I think I know what you're thinking: Game of the Year 2013? Already? That's crazy talk. You're thinking that 2013 is only three days old. You're thinking that a racing game fueled by the blood of its players could be 2013 game of the year right now, if said racing game was released some time between January 1 and January 3. All a game would have to do was exist and be released some time after Jan 1 to be the current 2013 GOTY. Ah, but if a racing game powered by the blood of its player was released in 2013, it would have to spar with the extraordinary Hundreds for top honors. Hundreds, for iPhone and iPad is a game that actually did come out in 2013... a game that is not just worth your attention because it is one of the first games of the new year...a game that will not take your blood but is so good that it will definitely take some of your life. Level 1: There is a circle on the screen of your iPhone or iPad. Touch it with your finger. It will grow. The number inside it will tick up. Keep holding your finger there. The circle will swell and the number will reach 100. Fine work! You passed the first level. Level 2: There are now three circles you can touch to make them grow. Their sizes must total 100. If you let one of them bump into the other as they grow, you fail. 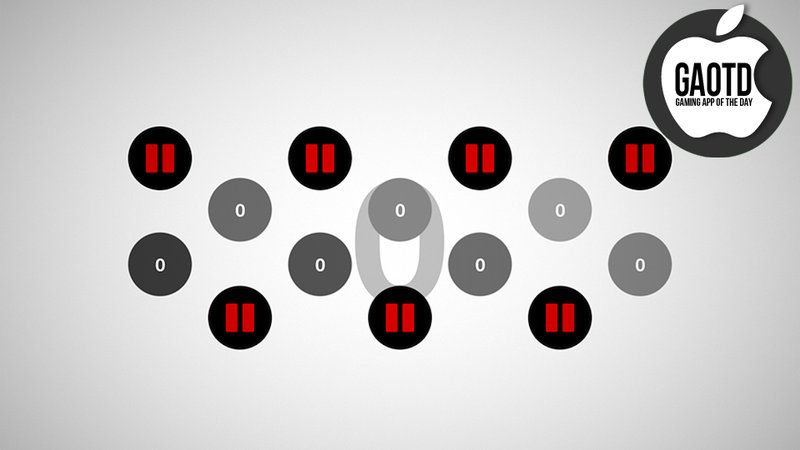 Level 3: There are five circles and now they are moving. Level 32: There are nine moving circles you can try to grow, one static non-growing circle that you can move, three that are locked in place and three buzzsaws that, should they come in contact with your growing circles, will chop them down to their starter zero-point size. Level 100: Who the hell knows what's in level 100. This game gets tough fast. Watch a trailer. You'll get it in a jiffy. ...is the image of pain. You can try a web version of the game's basic concept here, though the web game won't show you even a smidgeon of the twisted ideas that show up to make each level of the game a challenge of planning and reflexes (a game for your brain and your fingers!). Also, if you play this game, maybe you can crack the secret codes that show up after you finish a batch of levels. I'm having trouble with the cipher. I think we need to throw a crowd at it. Anyway, yeah, Game of the Year 2013 so far. Hundreds, which comes from the makers of such excellent mobile games as Canabalt and Gasketball looks good, sounds good, controls well, plays well in short bursts, has good iPhone-iPad cross-platform cloud-saving, vexes your mind, challenges your fingers. Hell, they even do something smart with the added screen space if you're playing it on an iPhone 5, though the game is way better on iPad if you have fingers bigger than a toddler. I'll let you know when I find a fatal flaw. But there may not be one. It's a gem and a must-have.